While I've made bagels quite a few times and they're always good, yours look extra good. I bet the whole wheat is delicious. I've copied your excellent post and hope to give them a try this week. Thanks Weavershouse. I hope you find it helpful. Great write-up with a few hints that I will use. I've only done bagels once, ala Reinhart, and they came out okay. With your suggestions my next batch will surely improve. I've also taken your suggestion (on other posts) of hand mixing to heart; it has improved my baking results. Thanks for taking the time to share your experience and talent. 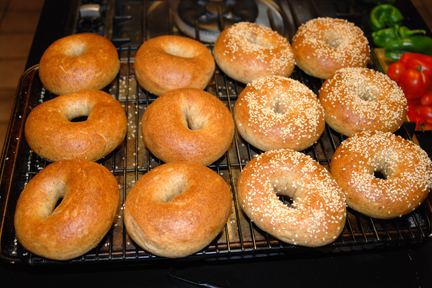 I'll make bagels : ) I certainly enjoyed reading and learning from your excellent post! Just what I think would be 'my kind of bagel baking day, I would enjoy! I'm certainly not a bagel eater..but when I do have one, for some reason I just have to have some sort of fruit in it...so I guess I'm definately not a bagel purist : ) but I really like yours and, have saved your post in my favorites! I also wish I could find more uses for my mixers, but it's hard to beat the old hands and, I love CH video's/baking too! My wife was in town yesterday and was stopping at Trader Joe's. I had asked her to bring home some frozen blueberries for today's bake. Unfortunately they didn't have any frozen and that's the best way to incorporate them from my experience. Next time. I agree, Hitz is masterful in so many ways. I marvel at his dough handling abilities. Something to aspire to. Oh, I bet those would have been tasty with the wheat! Have you tried adding fresh blueberries? I really perfer using fresh but, if they don't work? I image the dough to be to firm for incorporating a fresh fruit..frozen would be great too! I love the flavor and using the dried tart cherries and cranberries. Once I tasted my purchased frozen blueberries...I don't know if it was just the bag of small wild frozen blueberries..but they had no flavor compared to the ones...I freeze,... my own fresh now..I just rinse, dry and freeze fresh ones..delicious. Frozen fruit keeps so well and for a long time. That reminds me...I have some sliced fresh season peaches..I froze them, pie ready, in my pie pan..when frozen firm..remove them from the pie pan and placed into a plastic freezer bag...ready for my next pie day! Sylvia, I'm sure you are right about the home grown fruit tasting better. I add the frozen at the last fold and am careful not to crush it. The fresh we have around here is a short season so I've not tried freezing my own. Audra has a brother that has blueberry bushes and she says she freezes gallons of them with no trouble for later use. We don't have much of a peach crop either. In Michigan they have great peaches. Thank you so much for sharing your thoughts and experiences. Thanks Eric. I've had success using Reinhart's formula and technique from BBA, but the shaping has always been an issue for me. I also wondered about the water add-ins. Unfortunately most non-home made bagels these days are mediocre at best, and just torus-shaped white bread at worst. Home made is the only reliable way to get a true, authentic bagel. PR's BBA recipe was my first attempt many years ago too. I think I could have saved myself a lot of trouble had the Hitz video been available. There are many recipes that incorporate oil in the dough which I don't care for. I like the little bit of a crispy crust from the basic 4 plus malt. with 100 % sourdough. I have used the formula on Wild Yeast a lot of times over the past months and posted pics. They are completely fool proof so no ice baths or worry about floating ...no problem with complete browning or too open crumb. No stone needed and no steaming. They are chewy and delicious and you can't mess them up no matter if you boil 1 minute or 20 sec. ...I have done both. Give it a try...really ...so much easier . And shaping is a breeze. They come together with only a spritz of water at the joining point. I like the " flap" to show...it was pointed out to me that that was not " good". But it looks like a home made bagel ! I've made the sourdough version many times. It isn't any easier and SD introduces the variable of activity level. I like the way the dough feels better but there is little flavor distinction between their yeasted cousins IMHO. 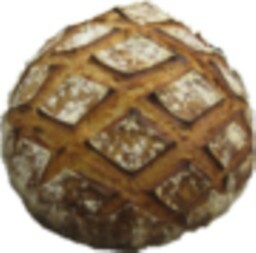 I was doing a post to demystify and clarify the process for the greatest percentage of our population who use yeast as a riser. The picture you paint where nothing matters and everything is perfect, no matter how badly you cobble it up, sounds too easy for me. I prefer a challenge. Thank you so much for this post so we can all benefit from your experience. 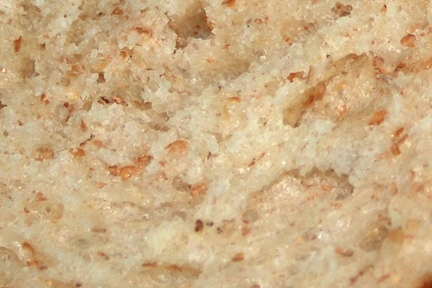 Your bagels are lovely and such a nice result with a hand mix! I have great respect for Hamelman, Reinhart, Hitz, Mike Avery, Norm Berg/Stan Ginsberg and Secrets of a Jewish baker. There are differences between them all in method and technique. When I come across a conflict like this, I tend to question everything and sort it out on my own. Not having to fool with the ice water is a help to the process IMO. The old NY bagel shops didn't do that and the videos I have seen from the big bagel bakeries where they use boards don't either. The bagel boards introduce water/steam to the process and help to hold the seeds on. I'm all for easier without compromising quality. I always marvel at when I get to work with the big dogs of baking is their incredible hand skills - and their strongly held and sometimes completely opposite views on this or that. Sounds like you are doing well on sorting things out. It's surprising how much I learn when I do the same a few times. I'm enjoying the bagels now more than ever. Congrats on the folding proofer. I think you will like it, especially when the temps get down. I hear from my BIL there 3 ski slopes open in CO already. Very nice-looking bagels. I've only ever used Hamelman's recipe and it worked fine so I'm sticking to it for now, although I must experiment with Lumos' ww ones and sourdough ones one day. So hand-folding at intervals works huh? Who would have thought with such a hard dough. I took Hamelman's advice to really work the gluten in the mixer and I must say it came together in a cinch with high-protein flours but I must try the hand-folding too. Like you, I ditched the ice water bath on my second attempt. I couldn't see what difference it made, and most of all, it's hard to keep a bowl of ice water very cold when you keep dumping boiling hot things into it, so the original purpose of the cold water would be nullified anyway. Also I place the bagels on dishcloths after fishing them out from the pot. I found that placing them on parchment just made everything very wet and messy. It's only a couple of minutes before I gather enough bagels to transfer into the oven on parchment. Has worked fine so far. I find that they are still pretty moist and sizzling when they hit the oven. There's quite a bit of steam generated. I've used blackstrap molasses and honey and I prefer the former. 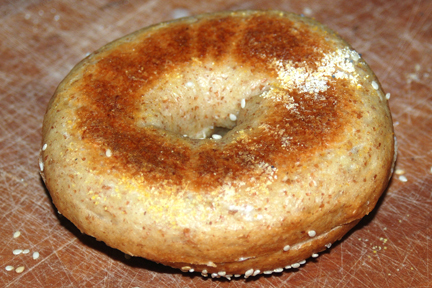 Have you see txfarmer's beautiful lye bagels posted recently? Apparently that gives a slightly different taste as well, in addition to being a beautiful reddish brown. I may be wrong, but my 2 pence on the ice water. My guess is that that part of instruction was really for a commercial baker (but not a huge one with huge equipments) who need to make much larger batches of bagels than us making 10-12 bagels at a time. 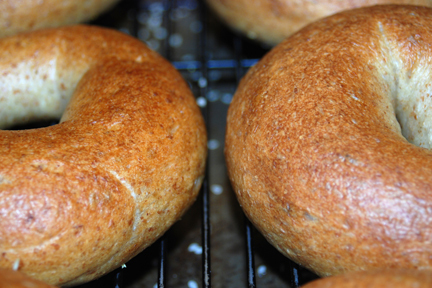 It may make a difference if you're making a large numbers of bagels, having to boil them in several batches. Dunking them in the icy water would stop them from over-proofed while waiting for a while for the rest of bagels to be boiled. Also I've read in one of bagel books I have that if you leave boiled bagels too long (like more than several minutes) you may end up with winkly skinned bagels, not smooth and shiny one we all like. Cooling the surface in icy water may help to prevent it, too. A few of Japanese bread blogs/sites that mention about the effects of iced water say it would increase the chewiness of the crumb. But if that's true, I have a feeling it's also because cooling them after boiled will stop them from over-proofed making them more bread-y than bagel-y. You might be right. But if you look at the Hitz video, he says to boil 10 seconds and place to cool on a wire rack. That is clearly a process aimed at the crust. A short boil then air dry and bake. Yes it would be harder for a commercial operation to prevent over proofing but in the videos I have seen they lift a dozen or so out of the water bath and dump them in a trough in front of the oven. There is always a water hose and they sometimes spray them down with cold water before being placed on the boards. For our purposes, I think a short time in the bath followed by a brief time on the rack to dry and cool some accomplishes the same thing, 3 at a time in my case. 10 seconds is quite a short time for boiling, isn't it? It may not warm the dough enough to cause over-proofing. But, anyway, yes, I agree. I don't think ice water procedure is not an absolute necessity for making bagels at home in small scale. I use a large, deep roasting pan for boiling that takes 6 bagels at a time, and put the boiled one on a tea towel to get rid of excess water, while I put another six in the boiling water. While they are boiling I put the first batch in the oven, adding the second batch when they are boiled, taking the first batch out of the oven first and then the second batch a few minutes later. Lovely bagels! And a helpful write-up, too. A question: you mention that the water that will be used for boiling the bagels is drawn the night before, rather than the morning of, baking. What does that contribute to the process or to the product? You must be about to draw the shades and lock the door. I couldn't decide whether it was intended reduce chlorine content or serve some other purpose. And now I know. Thanks. I would like to know if anyone has ever experimented with freezing bagels after the boiling stage then baking them up at a later time. This would work very well for me (if the quality does not suffer) to have a few fresh bagels when I want them. If anyone has done this do you bake the bagels frozen or should they be thawed first? I've never done that (freezing after boiling) but you can freeze the cooled baked bagels easily and reheat them in the toaster. Actually my daughter likes to slice them first and then put them in a zip-lock bag in the freezer.A couple minutes in the toaster and they are indistinguishable from fresh baked. If you are determined to freeze them before baking, I would do so after proofing and passing the float test with one. You will have to thaw them before boiling regardless, either overnight in the fridge, slowly, which requires planning, or on the counter which will take a couple hours. For some reason, thawing in a microwave seems to toughen the bread in my experience. Hope this helps. Excellent write-up, Eric. I always thought Bagels are complicated, but you made me wanna try it. I've never eaten or made bagels before, so... I don't even know what to expect of it. But seing a lot of guys here excited about bagels, I start to think I might be missing something good. Ciril makes it look easy, but I'm sure it's not. I don't have malt, unfortunatelly. But I intend to try them anyway. Thanx for the inspiration, Eric. try swapping out some honey for the malt. Or find a beer brewer who will have some no doubt. They are delicious and they carry well. Good luck and if you have questions, please don't hesitate. I wouldn't boil then the night before. The water will come to a boil as the oven is warming. I've never seen a 7 minute boil. If the dough is shaped the evening before and given a bench rest of an hour before refrigerating, you only need 45 seconds on each side or maybe a minute. That's just at a simmer too. Then apply seeds or topping and bake pronto. 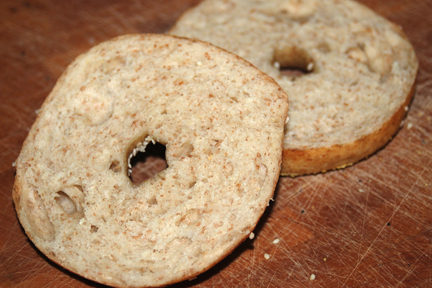 My favorite recipe for a yeast bagel is the one in Hamelman's Bread. I'm still mixing by hand and doing stretch and folds. Works every time. Let me know how yours work out. Great post. I am seriously struggling with leaving the dough over night! I prefer too shape them so that the next morning I can just boil and bake. But there is always a problem. It either totally deflates when I boil them, or I get a crust on them! I can't seem to figure out what the problem is. Any ideas?